One of the best things about community college is that you can transfer almost anywhere with your A.A. degree to continue to your bachelor's degree. However, the transfer process is not always easy. Yes, transferring credits can be complicated at some schools, but what most students struggle with is the social transfer. In my book, I write all about this in the chapter called "The New Kid Again," because that is exactly how I felt when I transferred from community college to a small university. It felt like everyone already knew each other and had no desire to meet anyone new. Most of them had made friends in the dorms years earlier and/or in their sororities. It was a hard adjustment. Hey Isa. 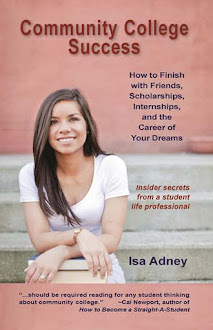 I just wanted to say I really enjoyed your book, especially Chapter 6, dealing with transferring to a new university. I am going through this now as a first semester transfer student and it's scary, lol. I wanted to ask you, how long did it take you to adjust when you transferred? Thanks so much for your kind words about the book - I'm so glad it's helping! As far as transferring timing, it took me about a month or two to adjust. I remember the moment I finally felt good - it was after a study group when a girl and I really connected. After our study session she started telling me a funny story about her ex-boyfriend. We laughed so loudly waiting outside for our next class that a student had to come out and ask us to keep it down because they were taking a test (oops!). But it was the moment I felt like I was finally a part of the school. She became my closest friend all two years, and was also a transfer student. While I didn't make huge groups of friends (e.g. greek life wasn't for me and I was a commuter), just having one close friend made all the difference. I also joined the dance team, the commuter club, and became an orientation leader for transfer students. Starting in each of those groups was terrifying, and I didn't always perfectly fit in with each group - but I never stopped trying. The involvement also led to me becoming the commencement speaker when I graduated, getting a free trip to London and New Orleans, and winning the award for the top graduating senior at graduation (which also came with a $3,000 check!). I also had a great faculty mentor who helped me find out about and win all of those opportunities. It was weird being the speaker when I knew so many of the students were probably thinking "who the heck is this girl? I don't remember her at freshman orientation." Anything is possible for you when you transfer, including making friends and fitting in. It may not ever be perfect, but if you keep trying, you will find that you will grow in ways that will serve you the rest of your life; truly successful people know how to adjust to new and scary situations. Consider starting study groups, try out a bunch of clubs, and find other transfer students. Don't be afraid to invite people to lunch or coffee, and keep putting yourself out there until something clicks. And don't feel bad if it takes a while.